But I digress. My point is, it was freakin' COLD out, the ground was frozen solid, so whenever it was time to take a break I'd kneel down wherever I happened to be standing and sit on my feet to spare more delicate parts from contact with the ground. And I'd just sit there in silence and watch the neighbors. Very few were out with the hush of the impending storm--it was supposed to start snowing at ANY MOMENT--but there was one lone movement: a hairy woodpecker that was bopping about on a dead oak limb about twenty feet overhead. "Hairy" is not a judgement call, but the actual species name should you care to look it up. 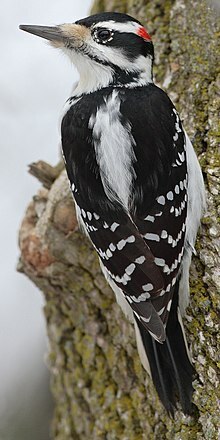 There are also downy woodpeckers, but they are a wee bit smaller, and their beaks are stubbier. The two different species are not related in the slightest, aside from being woodpeckers, and so are considered a prime example of Convergent Evolution. But again I digress. While everyone else was hunkering down this little guy was tapping rather desultorily at this limb, sort of going "hop, hop, tap, hop, hop, tap" the whole time I was carrying armloads of wood into the house. He was company at any rate, so whenever I took a break I would lazily look up at him and watch him hop around. He never left the limb and I can't imagine, in the bitter, bitter cold, that there were any bugs to speak of, but I am not a woodpecker so who am I to judge? So I would just zone out and stare at him, and then get up and move some more wood, then flop back down and watch him some more. Which I realize is WAY TOO MUCH EXCITEMENT for some of you, so I apologize for working you up so, but that's the way Mojo rolls. Live fast, die young, leave a good lookin' corpse. But again I digress. Anyway, third or fourth break in, I was idly staring at my new friend when he SUDDENLY changed his routine. He was still hopping and tapping about the limb, but now every five or ten seconds he let out a little squeak or shriek. It sounded like an alarm call, except woodpeckers are not the most musical of creatures and EVERY noise they make sort of sounds like an alarm call. He didn't appear to be worried or distressed or focusing on anything in particular (being way up in the tree he was pretty safe), but the sequence had changed to "hop, hop, tap, 'AAAHH', hop, hop, tap, hop, hop, tap, 'AAAHH', hop, hop, tap". I thought at first it was because I was so rudely staring at him--most wild animals do NOT like to be stared at--so I averted my eyes, but that didn't stop the shrieking. So I was sitting there, staring at the ground, wondering "What on EARTH is wrong with that stupid bird?" Because usually animals do things for a reason, don'tcha know. You just might not be aware of the reason, especially if he is twenty feet above you and can probably see a whole lot farther than you. Plus birds are ALWAYS on the lookout for predators, so if you listen to them they'll warn you about all sorts of stuff that's going on around you. And that's when--in the silence, broken only by the occasional tap and squeak of the woodpecker--I heard it. A large animal on the other side of the house. walking slowly and clumsily through the leaves. Coming around the house. Toward me. The woodpecker was telling me "We are NOT ALONE." It turned out to be Rosie, my super-elderly Golden Retriever. She always gets WICKED jealous when I pay more attention to firewood than I do to her, and after enough neglect had gone by she came out the dog door to try to convince me that dogs are much more pleasant companions than logs. My woodpecker friend watched in horror as she approached me, still putting out his little warning squeaks. But when there was no bloodshed he stopped the squeaking and just went back to tapping. I thought his warning was right neighborly, though. As was this ruffed grouse I encountered a couple of weeks ago. Clearly Mojo has a way with da boids!